The restaurant chain has never split its stock, but it has still delivered strong returns to long-term shareholders. The rise of fast-casual restaurants has surprised many industry experts over the past decade, and Chipotle Mexican Grill (NYSE:CMG) has been one of the most important players in the fast-growing field. Throughout most of its history, Chipotle has demonstrated an uncanny ability to tap into the demand for high-quality food offerings with its "food with integrity" motto, and its stock has risen along with its expansion throughout the U.S. market. Yet recent foodborne illness scares have been a major roadblock to Chipotle's upward share-price trajectory, and some wonder whether the Mexican food giant's best days are now behind it. Let's take a look at how Chipotle stock has performed throughout its history and whether the company can bounce back and set new highs. As you can see in the chart above, Chipotle has posted strong returns for long-term shareholders, even if the stock has given back much of its overall gains over the past year. Its rise since its 2006 spinoff from McDonald's amounts to more than 800%, giving investors who put $1,000 into the stock a position worth more than $9,000 today. Chipotle has had three main periods of strong performance for its stock. In the first couple of years as an independent company, Chipotle demonstrated its ability to capitalize on the huge opportunity it had to dominate the new-restaurant space. With growth rates that hurdled it past other concepts like Moe's Southwest Grill and Qdoba, Chipotle was able to build its store base into an empire very quickly. Consistently delivering financial results that exceeded expectations by huge margins also helped to send the stock soaring. The 2008 recession hurt Chipotle's stock along with shares of companies throughout the market, but the company bounced back in subsequent years. Soon thereafter, Chipotle had gotten back on its high-growth trajectory, sending the stock climbing steadily until mid-2012. At that point, shares took a hit because long-term growth rates started to slow down, and guidance for future results was no longer living up to the extremely high expectations that investors had set for the Mexican fast-casual chain. In response, Chipotle started looking at new ways to grow. The introduction of the ShopHouse Southeast Asian Kitchen concept introduced Chipotle shareholders to the idea that the restaurant chain could grow by branching out in a number of different directions, taking its high-quality food experience into different genres of food. Sustainable ingredients aren't unique to Mexican cuisine, and Chipotle investors got excited about the idea of expansion, which helped send the stock to all-time highs. Most recently, however, the foodborne illness scares have crushed Chipotle's stock. The bad news started in July 2015, when reports of an E. coli outbreak hit five people in Seattle. A bigger August outbreak of norovirus in California led to reports of more than 200 sick customers in Simi Valley, and a salmonella report in Minnesota affected 64 people in August and September. Since then, subsequent E. coli and norovirus incidents across the country have led to broader questions about food safety at Chipotle. In response, shares have lost as much as half their value, and the company's financial results provide a simple explanation. First-quarter comparable sales plunged nearly 30% as customers feared that the restaurant chain hadn't resolved the root causes of outbreaks. Where will Chipotle go from here? To recover, Chipotle has taken several actions. A rewards program has tried to give loyal customers an incentive to keep coming to the restaurant chain, and an expansion to its menu to add chorizo was also designed to boost interest. Yet the fast-casual giant hasn't provided much guidance on how well those initiatives have worked recently. The stock has therefore not made back any of its lost ground. Bullish investors are still hopeful. Many other restaurant chains have bounced back from foodborne illness incidents, and Chipotle is still opening new locations, sticking with its expansion strategy. More recent concepts like the Pizzeria Locale pizza chain and the potential for a burger chain in the future have bullish investors still hopeful about its growth prospects. In combination with stock buyback programs to take advantage of relatively cheap shares, Chipotle has confidence in its own future. 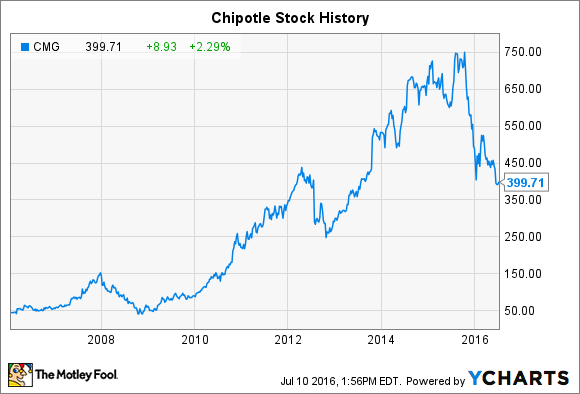 Chipotle stock is going through a big challenge right now, but its long-term track record has been quite strong. Over the long run, Chipotle's share price has a high likelihood of bouncing back and returning to produce new all-time highs.